Get an extra dose of art and culture at night in Sydney this autumn. From local artists to international stars, check out these after dark offerings across the city. First Fridays is a relaxing and stimulating way to participate in UNSW Galleries program of exhibitions, events, screenings and performances. Once a month we stay open after hours with a series of lively events engaging ideas in contemporary art and culture. Held on the first Friday of each month, join us for a changing mix of music and performance, ideas and debate, food and wine, and first-hand conversation with artists, makers, designers and creators. The MCA stays open until 9pm every Wednesday night – perfect for those who can’t visit the gallery during working hours. Lights on Later is a spontaneous and ever-changing event. Enjoy MCA exhibitions alongside hands-on workshops and talks by MCA tour guides. Hear informal talks by curators, artists and other creative thinkers on curious, sometimes controversial, topics. Wander up to the Sculpture Terrace overlooking Sydney Harbour and wind down with live music, a glass of wine and a bite to eat at the MCA Cafe. On Wednesdays the Gallery stays open late for Art After Hours, courtesy bus runs every 15 mins from 7pm until closing from the Gallery to various locations in the city with proximity to public transportation. 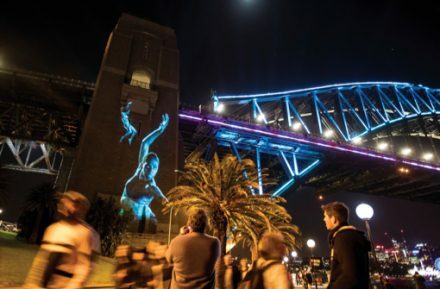 Badu Gili, meaning water light in Gadigal language, is a free daily experience that celebrates the ancient stories and rich contemporary culture of Australia’s First Nations. Tuesday 24 July 2018 to Sunday 30 June 2019. Screening times change with the sunset and season. See website for latest screening times. Explore the highlights of the southern sky on a night tour at Sydney’s oldest observatory. Use the telescopes to see the stars, Moon, a nebula, Mars or the planets during this quintessential Sydney experience. The Royal Botanic Garden Sydney’s pop-up bar, Busby’s Bar @ Victoria Lodge, returned to the Garden in spring with a new look and menu! Relax and sit back in sun chairs overlooking one of Sydney’s best harbour views while you enjoy coffees and pastries in the morning, or from midday, Bombay Sapphire botanical infused cocktails, tap beers, charcuterie, picnic boxes and other sweet and savoury small bar bite favourites. In 2019, West Side Story takes the floating stage at Handa Opera on Sydney Harbour. Encounter the wildness of youth and ecstasy of love as this modern day Romeo and Juliet unfolds under the starlit city skyline. Featuring classic Broadway hits including ‘Somewhere,’ ‘Maria,’ ‘Something’s Coming’ and ‘Tonight’. This all-singing, all-dancing cast takes on Leonard Bernstein’s brilliant score and Jerome Robbins’ original electrifying choreography. The National 2019: New Australian Art is a celebration of contemporary Australian art. The second of three biennial survey exhibitions, it showcases work being made across the country by artists of different generations and cultural backgrounds. Through ambitious new and commissioned projects, the 70 artists featured across three venues respond to the times in which they live, presenting observations that are provocative, political and poetic. The National is a partnership between the Art Gallery of New South Wales (AGNSW), Carriageworks and the Museum of Contemporary Art Australia (MCA). Spirit of Place has been a travelling exhibition of highlights from the Warburton Arts collection. This exhibition was first presented at the 2013 ASEAN Expo in Nanning, Guangxi Province, China; and touring Chinese museums including Guancheng Art Museum, Dong Guan; Yongjiang Inlet Art Museum, Nanning; Yunnan Art Museum, Kunming; Hohhot Art Museum, Inner Mongolia; Tianjin Art Museum, Tianjin; Sichuan Fine Art Museum, Chongqing; Jiangxi Provincial Art Museum, Nanchang; Heilongjiang Art Museum, Harbin; Dù Fǔ Cǎo Táng; Chengduand Shijiazhuang Art Museum, Shijiazhuang. Returning to Australia and exhibited at the Australian National University, Canberra, in 2018. The Australian premiere of this international hit is a spellbinding tale of sibling rivalry set against a backdrop of scientific discovery. Alice (Jacqueline McKenzie) is a scientist working towards an important new discovery. Jenny (Mandy McElhinney) is her sister and believes any conspiracy she reads on the internet. They couldn’t be more different. So, when tragedy forces them together, the impact has unexpected consequences. Autumn is a time for reading and for contemplation. A time to take stock of the past while planning for the coming Winter ahead. Waiting for the future. There is a subtlety to the changing of seasons that seeps into the subconscious. Leaves shift colour and fall. Andrew Ensor is a Sydney based artist that has been exhibiting with Gaffa for over a decade, this is his 32nd solo show. Chamber Pot Opera tells the story of 3 women who meet for the first time in a public bathroom. One is in an abusive relationship, another is terrified that she has come on too strong on a date, and the third has been promoted through the glass ceiling to land her dream job. Together they sing of shared histories, traumas and fantasies using a catalogue of popular music from the operas of Puccini, Mozart and Bizet. Suzanne McRae’s work is immersed in sentimentality and the haunting nature of memory. Suzanne’s creatures are the anthropomorphic bridge between human and animal, the past and present, and truth or dream. A melancholic yet enticing longing for ornaments from past generations. They may seem strange and awkward now, but they have miraculously outlived their owners. Object Space is a window gallery located in the window of the ADC Offices on William Street in Darlinghurst. The exhibition space has direct street frontage, is accessible to view 24 hours a day and is lit for viewing at night. The Moro Spanish Film Festival 2019 program includes 32 films divided into 2 sections: New Spanish Cinema and Cine Latino. The festival brings you a spotlight on female directors, showcasing a selection of 11 films. From well-known established directors such as Icíar Bollaín and Gracia Querejeta to fresh new voices like Lila Avilés, these films represent the strong directing talent of some of the most exciting Spanish and Latin American filmmakers. The Sydney Comedy Festival is Sydney’s biggest annual comedy event. Every April and May, hundreds of the world’s funniest comedians take to stages across Sydney to entertain an audience of more than 120,000 people, followed by a 50+ stop Showcase Tour across Australia that performs to over 25,000 annually. The Festival kicks off in grand style with lavish gala events: the Sydney Comedy Festival Gala at the Sydney Opera House, Enmore Theatre, The Concourse Chatswood and Riverside Theatres in Parramatta. Sydney’s biggest month of comedy kicks off in grand style with the Sydney Comedy Festival Gala at the Sydney Opera House! Featuring a dazzling line-up of the Festival’s funniest international stars, Australian legends and next-big-things in comedy, the Gala is the premier comedy event in Sydney’s cultural calendar. The walls of the Sydney Conservatorium will again pulse with that powerful distillation of chamber music that is the Musica Viva Festival. Heading the list of visiting artists for 2019 is a double bass player who is only ever referred to as “the best in the world”: Edgar Meyer. He is joined by some of his friends and collaborators – the Dover Quartet and pianist Andrew Tyson – as well as getting to work for the first time with the brilliant young violinist Tessa Lark and our own chamber music legends, the Goldner String Quartet. Each year, Sydney Writers’ Festival presents more than 300 events, attracting audiences of up to 100,000 for a week-long conversation of books and ideas. From 29 April to 5 May 2019, thousands of readers and hundreds of writers will come together at our Festival hub at Carriageworks and venues across the city such as Sydney Town Hall and City Recital Hall. Journey of the Chinese imperial art collection in the Republic era. This lecture will discuss the vast and extraordinary history of the Chinese imperial art collection since the early twentieth century. From its change in ownership from the imperial Qing dynasty to the Republic of China, to its first international exhibition in London, to relocation from the Forbidden City to inland China to escape the Japanese invasion and its partial move from the mainland to Taipei at the end of the Chinese civil war, this collection has a dramatic and fascinating history. Introducing Festival UnWrapped. A new bi-annual series of Australian performance works which are inherently original and extraordinary. Festival UnWrapped is a platform which champions the artist. From cabaret to dance, theatre and more… prepare for the unexpected. This is your chance to dive into the very best independent Australian performance. Inspired by the landmark TV series, Women of the Sun, Winyanboga Yurringa (Win-yan-boe-ga Yur-ringga) begins in familiar territory – a gathering, a return. But little by little the play rises to a sublime, surprising act of belonging and remembering. It’s beautiful. Presented in association with Moogahlin Performing Arts Indigenous theatre at Belvoir supported by The Balnaves Foundation. Extinction of the Learned Response is a taut psychological thriller that asks, what really separates human from animal – or from monster? A sensitive, deeply personal story of Ghenoa Gela’s experience as a Torres Strait Mainlander as she determines her own cultural and political identity. Ghenoa Gela is a multiple award winning choreographer, acclaimed comedian and proud Torres Strait Mainlander. Drawing on the traditional and the everyday, the political and the personal, her story is humorous, irreverent and moving. Following a sold out Sydney Festival season in 2018, Ghenoa returns with her show that seamlessly marries laughter and deep reflection. Playlist is a compelling new theatre work by PYT Fairfield exploring the state of feminism in pop culture and music today. Full of suburban dreams and pop star fantasies. Directed by Karen Therese and choreographed by Larissa McGowan, it’s a call to action about the critical issues of our times.